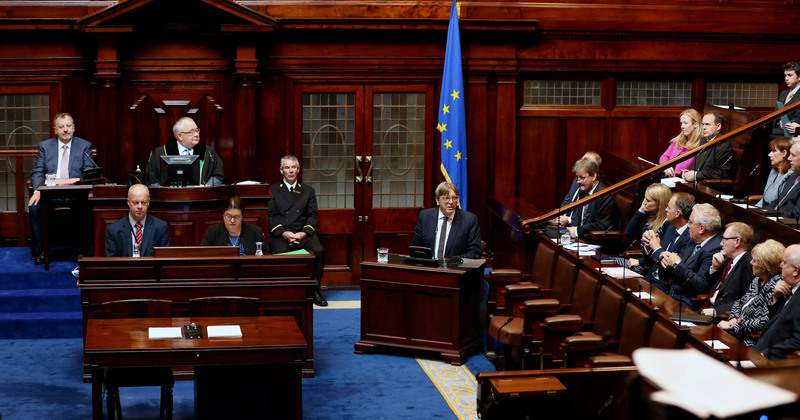 Ceann Comhairle Sean Ó Fearghaíl has come out in support of suggestions concerning the establishment of a special forum on LGBT+ issues in Leinster House. Ceann Comhairle Sean Ó Fearghaíl has come out in support of a proposal by gay TD Jerry Buttimer, which would see an LGBT+ group set up in the Leinster House. The group would provide a supportive space for staff and politicians as well as organise conferences, campaigning, and social events to address LGBT+ issues. Jerry Buttimer, who recently married his partner Conchobar Ó Laoghaire, said that the group will push legislation to support the LGBT+ community in Ireland. TD Jerry Buttimer at his wedding to his husband earlier this year. “It is important the Oireachtas builds on the success of the marriage referendum. The aim is to create a parliamentary forum, an opportunity for people to discuss the matter,” the Cork TD said. Ó Fearghaíl has written to all TDs and senators, stating that himself, Cathaoirleach of the Seanad Denis O’Donovan and the clerk of the Dáil, Peter Finnegan, all support the initiative. He also asked that all TDs have a say in what sort of role such an initiative would play in the Oireachtas. “The group could, for example, organise seminars, social events, lectures and so on, and we would very much appreciate early suggestions from all working in Leinster House,” Mr Ó Fearghaíl wrote. The proposed forum has gained support from An Taoiseach Leo Varadkar as well as Minister for Children Katherine Zappone and longtime LGBT+ rights campaigner senator David Norris. He also stated how they are examining other such forums in other parliaments. Additionally, Buttimer said that the forum could look at issues such as access to PrEP. “We would be a general group, not a government one. We have work to do on gender recognition and the availability of services where people feel vulnerable,” he said. Buttimer is set to visit Washington this week for an international LGBT+ conference at the Victory Institute where he will be addressing guests alongside a new international caucus for the LGBT+ community.